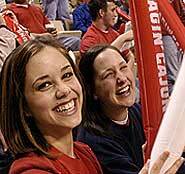 The final Early Fall Orientation session for new freshmen who have applied and been accepted to UL Lafayette for the fall 2003 semester will be held on July 22-23. All first time freshmen are required to attend an orientation session to meet with their academic advisor, select classes for the fall semester, register those classes through UL Lafayette's online registration system, and participate in interest sessions related to the first year college experience. Students who attend Early Fall Orientation will have the best selection of classes. Pre-registration for orientation is required and must be complete by Friday, July 18. To register, students must return their orientation registration form with the $60 program fee. Students may call the Orientation office at (337) 482-6495 for more information about the Orientation program or to request a registration packet. Students may also register in person in the Office of Enrollment Services, Martin Hall, 169. Persons who have applied for admission but are unaware of their admission status should call UL Lafayette Enrollment Services at (337) 482-6467 for current information on their file.